The ExaNIC V5P is an FPGA based network application card, specifically optimized for low-latency and high density datacenter applications. The device is built around a powerful Virtex Ultrascale Plus (VU5P) FPGA, packaged into a compact, half-height half-length, form factor and paired with 9GB of DDR4 DRAM and 28MB of QDR-IV SRAM. 100M/1G/10GbE PCS/MAC with 9.6ns (TX + RX) latency performance. Low latency, high throughput PCIe (Gen 3) DMA engine. Low latency QDR IV memory controller with 30ns access latency. Timing, signalling and register interfaces including I2C. Packet field extractor and frame multiplexer (with source code). Asynchronous FIFO and CDC modules (with source code). Like all ExaNICs, the ExaNIC V5P functions out of the box as a high performance network adapter. The entire ExaNIC software library is available, including the ExaSock sockets application acceleration system and the libexanic userspace direct access API. The ExaNIC V5P is also available in larger Ultrascale+ VU7P (1.7M logic cells) and VU9P (2.6M logic cells) variants. 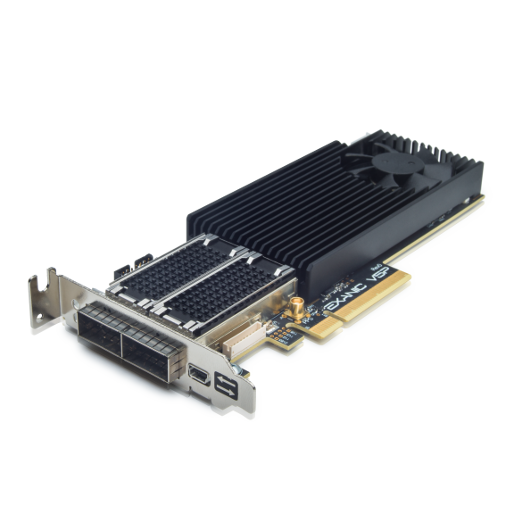 A PCIe 16x variant can be made available upon on request.